As I have said, I’m not a big-time blog guy. I’ve been told that if you are following my blog and you get an email of a posting, apparently there is some sort of size limit on those emails, the entire posting doesn’t always appear in the email automatically being sent. The blog site sending out the email truncates the actual posting to the blog site. So, until I get a better handle on how the blog site operates, I’m going to back myself up with these emails and I’m going to make the blog posts smaller, using the box.net cloud storage facility for the more lengthy stories and such. Once I determine the reliability of this sort of set up, I’ll quit these emails. Since my little netbook computer blew up on the third of January, I have gotten several replacement machines thanks to my generous friends who are switching from Windows technology to the Apple world (surely in the end, they WILL regret it!!! I will never do Macs, I promise.). I have gone from Windows 7 “lite” to Windows 7 “Professional,” a big and welcome change. Of course, when you blow up a machine, this is obviously the time to do all the things you say you were going to do but never get around to. I have sorted through so many stray files and disorganized folders and restructured my file system in a much more efficient and logical manner. It is tedious and time consuming but, in the end, it pays off. And, for sure, I’ve come up with a good backup facility. An old friend who I have been out of touch with for about a hundred generations saw “Small Mountain Rambles” and tracked me down. As it turns out, he stayed in the Windows camp and he was a big help in setting up the new machine. The same as me, he goes back to the punch card days of computer technology. He turned me on to a bunch of open source software (that usually means free) to protect the machine from viruses, malware and all that other bad stuff as well as a number of great third party system utilities which I’ve had to learn. This is the most professional machine I’ve had in about ten years, when I was consulting with Bell Labs. As well, I now have the Dream Weaver web site builder and several other professional level image processing applications (and gigs and gigs of RAM) which I had to forgo previously. I just couldn’t afford them. Hopefully, after taking some time to bone up on Dream Weaver, I might finally be able to sell myself as a web site builder. Now I have the tools to do it right. This rebuilding effort has been strenuous and pretty overwhelming but for the most part, it is now complete (along with some pretty unwelcome personal issues yet to be resolved). Now I can start being a bit more productive. While I’m still not real comfortable calling myself a writer, I’ve pretty much committed myself to that moniker. If you are going to be a writer, you write, you don’t exclusively repair computers. So, now, with a well working machine, I picked up my list of projects and I’ve started working again. 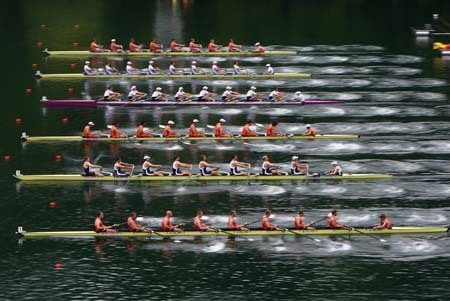 The latest piece is the story of the first regatta on Lexington Lake. A lot of the old timers have been asking why I’ve obviously been avoiding some very memorable but very dicey events in our mutual past, like Belly Bucking and the “Shooter-Scooter” races. Those were some highly unique and “specialized” sporting events which Los Gatos activists were able to get on national TV, like on the antiquated “ABC Wild World of Sports.” I’ve wanted to make sure I portrayed us as hard working, responsible and sensible young people before I made a big deal of our more creative and exuberant endeavors, like Belly Bucking and Shooter-Scooter races.